There’s a party going on at the Maltz Jupiter Theatre, a high-energy, high-stepping blast grafted onto a score of pre-existing hit songs by the Swedish pop rock group ABBA. And it goes by the name of Mamma Mia! 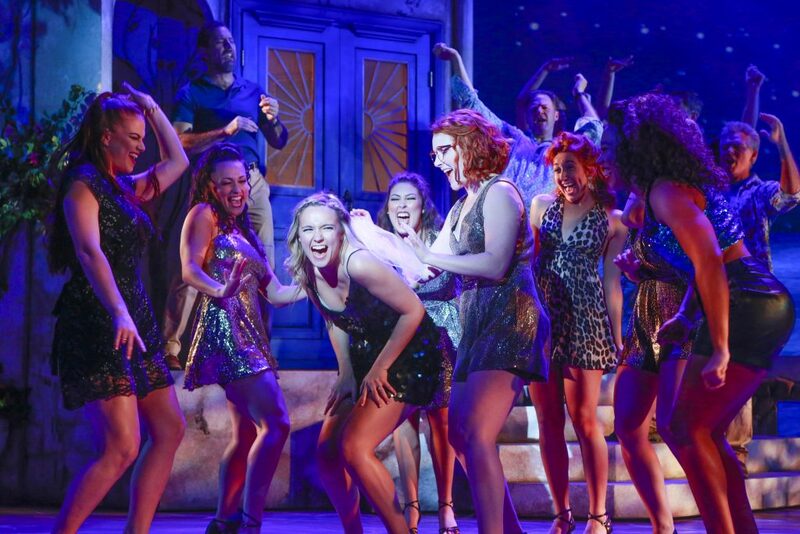 As long as you do not mind that this show’s musical numbers only occasionally seem specific to the story line, you can have a giddy, good time at Mamma Mia’s aural and visual sensory overload. Caution: If you stop and think about the haphazard way this jukebox musical is constructed, it will only get in the way of your enjoyment. So turn off your brain, sit back and take in the exceptionally winning production that director-choreographer Mark Martino has assembled. 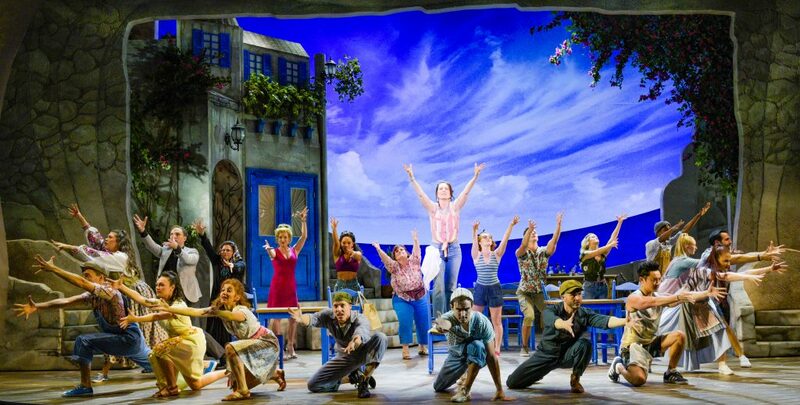 His cast – several of whom are Mamma Mia! 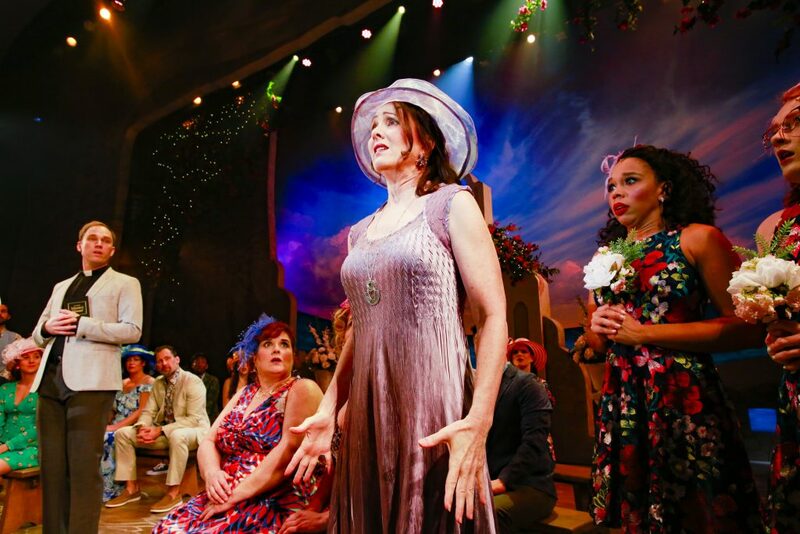 veterans – is unflagging in its effort to entertain us and the design team has outdone itself with the Aegean island scenery, the Crayola-colored lighting plot and the playful costumes. If the intent was to mask the flaws in the show, it almost succeeds. Of course, it seems pointless to mention the shortcomings of a musical that ran almost 15 years on Broadway, spawning a hit movie version and a sequel. Certainly the Maltz’s opening night audience, which sprang to its feet during the raucous, post-curtain call mini-concert medley, seemed enthralled by the show. By then, they had such bass-heavy, insistent numbers as “Dancing Queen,” “Super Trouper,” “Gimme, Gimme, Gimme” and the title tune rattling in their heads. Benny Andersson and Björn Ulvaeus may write simplistic lyrics, but they sure know how to devise earworms. The show’s story concerns a single mom, the former lead singer of Donna and the Dynamos before she turned her attentions to running a Greek taverna and raising a daughter, Sophie. Now 20 and about to be married, Sophie yearns to know who her long-absent father is. But since Donna was a free spirit in her youth, there are three possible sperm donors. Without telling her mother, Sophie invites them all to her wedding, hoping to figure out which one is her dad in time to have him walk her down the aisle. You were expecting maybe Shakespeare? Mary Mossberg, who played Donna in one of the show’s many national tours, returns to the role with authority, notably on the score’s one legitimately dramatic number, “The Winner Takes It All.” She is well-paired with winsome Becca Andrews, a feisty knockoff of her independent mom, though unnerved by the prospect of marriage. This may be the most attractive physical production the Maltz has ever mounted, and that is no small feat. From Kevan Loney’s underwater projections to Paul Tate Depoo III’s evocative island sets, we are convincingly transported to a Hellenic fantasy. Add Zach Blane’s color-saturated lighting and Andrea Hood’s hooty costumes and you have a first-class package of excess. Director Martino moves the evening along fast enough that the audience probably hasn’t the time to question the show’s logic. So leave your critical eye at home and go enjoy Mamma Mia! But like it or not, do not rush out after the curtain calls or you will miss the best part of the party. MAMMA MIA!, Maltz Jupiter Theatre, 1001 E. Indiantown Road, Jupiter. Through Sunday, Feb. 10. $60-$120, 561-575-2223 or call www.jupitertheatre.org.